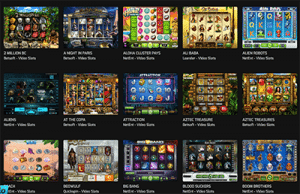 Games – pokies, blackjack, roulette, baccarat, poker, craps, keno, video poker, live dealer games. If you’re looking for a vibrant and cheerful place to play a selection of the best real money casino games on the Web, Hello Casino offers a good option. While there’s nothing in particular that makes this casino stand out, it’s well regulated, offers friendly customer support and is committed to releasing new games with a focus on player entertainment. All up, it ticks all our boxes for a safe and engaging place for Aussie players to place real money wagers on a large range of casino variants, with some sweet promotional offers to boot. Hello Casino offer new players a 100% matched deposit welcome bonus up to $100. The casino also has new promos available every week for new players, but you’ll need to sign up for an account to receive news of these offers via email. Like all leading online casinos, Hello Casino is available for instant-play, which means games are available directly over your Web browser without having to download any software. All titles are available to sample for free in demo mode, bar live dealer games which require real money bets in order to play. The game lobby is perhaps a little clunky, although we really like the way Hello Casino has provided a screenshot of each game, so you get a little preview of what to expect before you pick a title. You can use the navigation bar to search by specific title, software provider, most popular, most recent or alphabetically. Hello Casino offers real money games from some the leading software providers in the business, including NetEnt, BetSoft, QuickSpin, Leander and more. It’s interesting that Hello doesn’t offer Microgaming titles, one of the major players whose games can almost always be found at an online casino. While there’s plenty of great, popular games to make up for this, some players may be disappointed that the Microgaming collection isn’t available, especially those who chase the wide area progressive pokies offered by Microgaming. 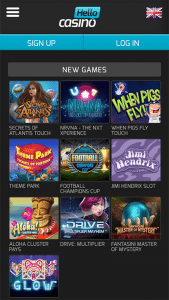 It’s also important to note that while the homepage advertises NetEnt’s high progressive jackpot games like Mega Fortune, these titles are currently unavailable for Australian players. Pokies – Starburst, Gonzo’s Quest, Aloha! Cluster Pays, Twin Spin, Jack & the Beanstalk, Jimi Hendrix, Koi Princess, Drive: Multiplier Mayhem, Fruit Shop, Steam Tower, King of Slots, Secrets of the Stones, Wild Water, Elements, Spinata Grande. Progressive jackpot pokies – Geisha Wonders, Mega Joker, Super Lucky Frog, Tiki Wonders, Icy Wonders, Cosmic Fortune. Blackjack – 21 Burn Blackjack, American Blackjack, Blackjack Classic, Blackjack Pro, Double Exposure Blackjack Pro, European Blackjack, Single Deck Blackjack Pro. Roulette – American Roulette, European Roulette, French Roulette, Roulette Advanced, Roulette Pro, VIP American Roulette, VIP European Roulette, Zoom Roulette. Other – Baccarat, Craps, Pai Gow, Red Dog, Casino Hold’em, Punto Banco, Oasis Poker Pro, Three Card Rummy, Instant Keno Classic, Studio1 Bingo, Triple Wins, Lucky Double, Traditional Keno, Deuces Wild Double Up, Split Way Royal, Jacks or Better Double Up. Want to play live dealer games, the hottest thing in online casino gaming? Hello Casino uses Ezugi and NetEnt live dealer software, two of the premium names in live dealer gaming. These interactive games are hosted from sophisticated casino studios by professional, attractive croupiers and streamed to your computer via live video feed so you can watch the action unfold in real time. The live games available at Hello Casino include Live Common Draw Blackjack, Live Baccarat, Live Keno, Live Lottery, Live Roulette, Live Blackjack and Live Automatic Roulette. Hello Casino’s mobile site is arguably even better than the desktop site, with the game lobby and use of drop-down menu flowing a little more smoothly on the small screen. There’s a huge collection of mobile optimised games available, especially pokies, but you’ll also find a solid selection of table games. Unfortunately there are no live dealer games available for mobile. Just like the full desktop site, Hello Casino mobile is available for instant-play, with no downloadable app available. This means it’s accessible via all data-enabled smartphone and tablet models, working flawlessly with iPhone, iPad, Android and Windows Phone. The most loyal of players at Hello Casino will be invited to become a VIP member once they meet certain requirements. Entry to the VIP program earns you invitations to special events, exclusive promotional and bonus offers, and the choice between joining the VIP bonus program or VIP cashback program, which gives you up to 20% cashback on your losses. You’ll also receive your own personal account manager who is there to assist you 24/7. Withdrawals are only available using Visa, Skrill, Neteller and bank wire, with a minimum withdrawal of $25 required for all payment types. Under the ‘support’ tab you’ll find a comprehensive list of FAQ’s where you can find answers to basic questions like how to get started, account information, bonus details, deposit and withdrawal options, etc. If you can’t find what you’re looking for there, click on the ‘Hello Live Chat’ button located at the bottom left hand corner of the screen where you can talk to a customer service rep straight away. If live chat isn’t available, simply send your query to [email protected] where they aim to answer your query within an hour, depending on the complexity. Hello Casino is licensed by the highly reputable UK Gambling Commission and Curacao e-Gaming. All transactions are protected using 128 Bit Digital SSL (Secure Socket Layer) encryption so you can be sure you’re playing in a protected digital environment. All players who sign up at Hello Casino are required to provide official ID in the form of passport or government issued identification card before any real money wins can be withdrawn. In conjunction with this requirement, make sure you sign up using your correct personal information if you intend to play for real money. Visit Hello Casino to sign up for a new account and claim up to $100 in bonus money today.